When building a form (LOI, Application, etc. 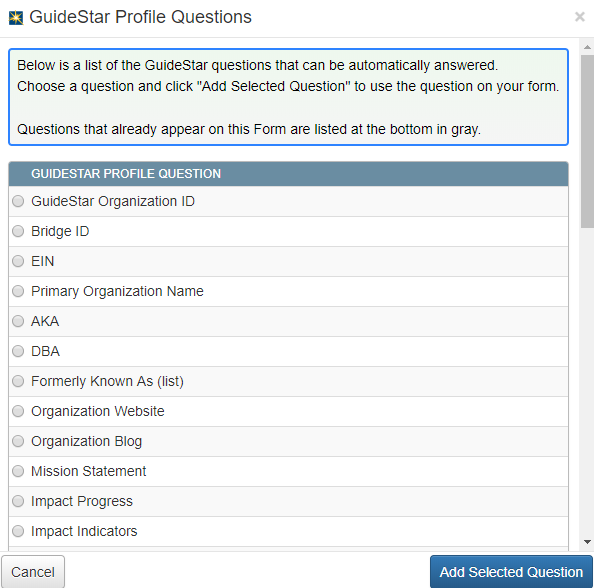 ), select the Add Question button and then select the GuideStar Profile Question field type. A list of all the GuideStar Fields available for use on the form will appear. Select the GuideStar field you would like to add to the form. Just like any other question you also set the character limit, Visibility and Required Type. Then click Add Question, and the field is now added to your form. Repeat these steps to add all of the desired GFGSA to your form. Note that the GuideStar logo appears next to the question as a visual indicator that the field is a GuideStar for Grant Applicants Field.